13ft – 11ft (390cm – 340cm) 7:3 action zoom rod (our premium big fish rod) This rod has great balance for a big fish rod and a strong action for controlling fish, it also still works great for little fish. 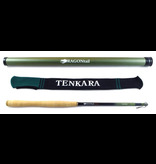 If you are just getting into Tenkara, you might consider this rod if you are concerned about handling larger fish but also want to use the same rod on small streams with smaller fish. Made with a higher grade of Carbon Fiber than most rods near its price range.